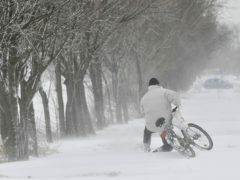 Ice and snow disrupted travellers and closed schools on Friday morning as the UK struggled through the coldest night for seven years. Snowfall and icy conditions are expected to cause widespread travel disruption on Friday morning after temperatures plummeted as low as minus 15.4C (4.3F) overnight. Parts of the north-east could see the mercury plummet to as low as -10C tonight, with some areas not even budging above freezing during the day. Police in the Highlands have revealed a car was stopped with its windscreen almost completely covered in snow. Weather experts have predicted the cold weather is here to stay over the next few days and into next week – along with strong winds and the return of snow. A foundation has ensured more than 100 youngsters in need in the north-east have received a winter coat. Council chiefs have placed one-tonne community salt bags at 20 locations around Aberdeen. A north-east road safety group has warned that older drivers are more at risk of a collision this winter. A motorist's car was seized after they were caught driving without insurance and no MOT in the north-east. Officers in the north-east are encouraging the public to think ahead before driving this winter as part of an initiative. Plans to grit almost half of Aberdeen’s roads before 7.30am as part of winter preparations have been announced by council chiefs. More than 1,800 people died across the north-east last winter – the highest total in at least a decade. The public could be given snowploughs to help battle winter conditions as part of a north-east council’s roads plan. A total of £1.72 million will be spent gritting Aberdeen’s roads and pavements this winter. Aberdeen City Council is to invest in 20 new large-scale community grit bins ahead of winter. New large-scale community grit bins and automated gritting could be introduced across the city as the council counts the cost of a severe winter. The severe winter has cost Aberdeenshire Council more than £7 million to grit and clear its roads and streets. A North-east animal sanctuary has made a renewed appeal for winter feed for animals in its care amid ongoing poor weather. With extreme cold and heavy snow forecast for the North-east, Police Scotland is reminding motorists to consider if their journey is necessary and make sure their vehicles are prepared for the conditions. Aberdeen City Council has paused its community salt bag scheme while it works through a "rather large backlog". A weather warning for rain and snow has been issued for parts of the North-east. You may have already tried this as a child, but it appears fresh snow might be safe to eat. At least that’s what scientists claim. Hospital staff across the North-east have been praised for coping with “continued challenges” over the busy winter period.